Of course everybody is familiar with CB radios. Don't even think about driving without one. It will help you find out a lot of information - road and traffic conditions, appropriate routing, directions to places, DOT inspections, low bridges, weigh station status, weather, and when it's your turn to back into a dock at a customer amongst a multitude of other things. You don't need a top of the line radio, but you want a good one. If you spend between $100-$200 on a well known brand like Cobra, Uniden, or Galaxy you'll be fine. That's all I ever used. Also get a decent antenna. Spend about $15-$30 dollars on one and read the directions for tuning in your SWR. It stands for Standing Wave Ratio and basically matches up your radio with your antenna to get the best results. If you don't want to mess with it too much just go to any CB repair shop near one of the truck stops and let them help you out. They may try to talk you into all kinds of stuff like getting bigger finals, getting it 'peaked and tuned', and noise effects. This stuff will all be fine to do one day down the road but for now just worry about getting a decent radio, antenna, and tuning in the SWR. If you get that taken care of you'll be in great shape. The fancy stuff you can worry about another time. Of course everybody is familiar with CB radios. Don't even think about driving without one. Most companies now use some form of satellite communications, or SATCOM. This is quite simply a way to send and receive messages with the office staff at your company, most notably your dispatcher. You can type messages back and forth anytime, from anywhere. Your company will also send all of your load information to you over your SATCOM. The messages will be saved up until the point that the memory is full and then the oldest message will be deleted to make room for the newest one coming in. Anytime someone at your company makes a promise to you, or ok's something over the phone, make sure they send that message to you over the SATCOM. Your company will save all SATCOM messages for a very long time. If they sent the message to you over the SATCOM then you've basically got it in writing. You're good to go. Also, don't send any messages over the SATCOM that you wouldn't want to share with the rest of the world. If you have to discuss something with someone and you don't want it permanently in writing, do it over the phone. Don't send a messages like, “hey, I'm out of hours and falling asleep but all I care about is money so I'm pressing on.” Can you say “prosecuting evidence”? Keep private conversations off the SATCOM. Anytime someone at your company makes a promise to you, or ok's something over the phone, make sure they send that message to you over the SATCOM. Some of the larger companies are beginning to use radar and video cameras to help the driver increase his awareness of everything around him. As of this writing in early 2007, most of these devices help very little, and some are pretty much junk. This isn't just my opinion...this is the common opinion amongst experienced drivers. Let's talk about some of the devices you may come across. Radar systems are an awesome idea in theory but the technology hasn't developed enough to really make it useful most of the time. One example is a unit that puts out a signal out in front of the truck and another signal along the passenger side of the tractor. 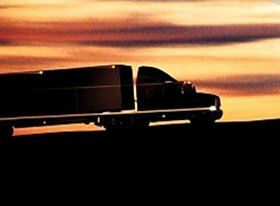 The signal out the front of the truck will track your closing speed toward any obstacle in front of you. The theory is that if you are closing in on something too quickly, like a vehicle moving quite slowly in front of you, a series of lights and sounds will alert you of the danger level.